Dispute Resolution in New Zealand is the only book that reflects the range of dispute resolution processes in New Zealand. This new edition builds on the work in the first edition by incorporating statutory changes and commentary on dispute resolution which have emerged since the... read full description below. Dispute Resolution in New Zealand is the only book that reflects the range of dispute resolution processes in New Zealand. This new edition builds on the work in the first edition by incorporating statutory changes and commentary on dispute resolution which have emerged since the first edition was published in 1999. The book clearly presents the main features of each dispute resolution process and gives guidance on skills which can be applied. All chapters have been fully revised and updated and each chapter concludes with a practical exercise which is used to illustrate and apply the information presented. _ Investigative processes are increasingly being seen as a specialist area of dispute resolution, and are particularly important in dealing with disciplinary matters. The book is directed to those involved in dispute resolution processes in New Zealand, and is aimed at enhancing the knowledge and the skills required to make the most effective use of the dispute resolution options available. 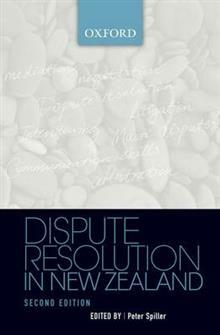 Dispute Resolution in New Zealand 2nd edition is an essential resource for law students and for qualified lawyers, who are increasingly being required to address the full range of dispute resolution processes available.